In April, 2006, over 350 public schoolteachers and professors from Canada, the United States, Mexico, Guatemala, and Bolivia, came together for four days in Oaxaca, Mexico. They exchanged experiences, built bridges for teacher solidarity, and learned about the policies impacting public education in each country. Granito de Arena screened for a crowd of over 250 people, on the third day of the conference. Schoolteacher from Bolivia makes a presentation about indigenous education in Bolivia, at the Trinational Conference in Defense of Public Education, in Oaxaca, Mexico. 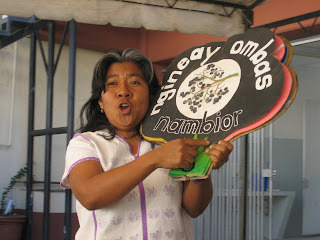 Teacher from San Mateo del Mar, Oaxaca, demonstrates how she teaches children to read in their native language of Huave.